A talk on Wednesday night presented by Architecture Media as part of the Melbourne Architecture Annual festival running all this week. The theme of the talk was architecture and celebrity, featuring two projects – Arm End House by Stuart Tanner Architects for Brian Ritchie, bass guitarist for the Violent Femmes, and East St. Kilda House by De Campo Architects for Callum Morton, installation artist. The talk was held in the surprisingly-hard-to-find Treasury Theatre and was well attended by, we estimate, 300 or so people. Intended as a conversation between architects and clients, it maintained a casual tone that offered ample opportunity for both Ritchie and Morton to contribute their own valuable observations. The conversation provided engaging insight into the relationships between the architects and clients, the stories that brought them together and the ideas that informed their projects. Curiously, both Tanner and De Campo appeared reticent to reveal their designs to the audience: Tanner never showed a finished plan and both spent the majority of their presentations discussing the ideas that led to their projects rather than the projects themselves. 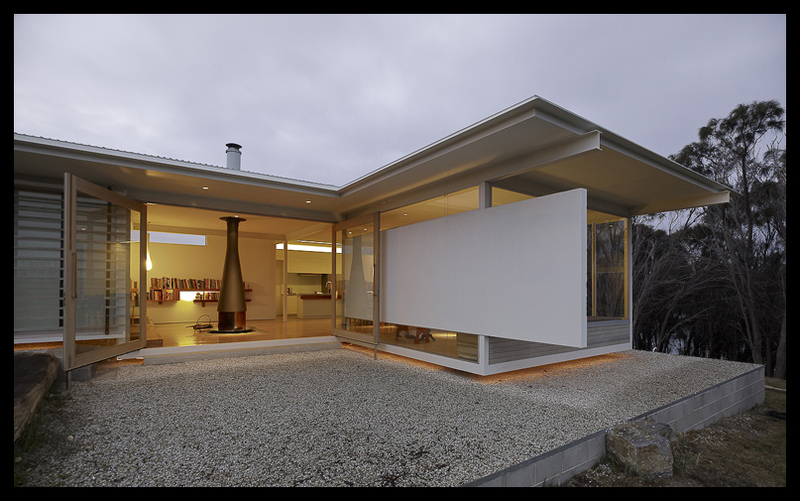 Nevertheless, Arm End House is a beautiful project on a stunning piece of land in South Arm, Tasmania. It has been crafted by a considerate and intelligent architect for an involved and generous client. It sits comfortably in its landscape, an immaculately detailed “jewellery box” that recalls the modesty in scale and presence of the traditional Tasmanian beach shack. It engages with both its client and its environment in meaningful ways: its siting behind a line of she-oaks obscures the coastline view but protects it from high winds and the public beach promenade beyond. Its planning and detailing respond intimately to Ritchie and his wife’s history and interests. It employs locally-grown timbers that are applied in specific ways to encourage weathering and the registration of use. A masterful piece of architecture. Located on a “nondescript street” in suburban Melbourne and constrained by all the usual planning regulations, East St Kilda House was never going to have the same traditional attraction as Arm End House. However, its blank brick facade, mono-palette and small window apertures render it even more unapproachable. We found this project very hard to understand – in part because De Campo’s presentation style involves jumping from topic to topic without a continuous narrative, and in part because the project is so simple it almost appears undesigned. Morton referred to it as brutalist architecture, however we fail to see any of the machismo or raw structural power of that era. The practice of architecture has many subjective qualities: style, detail, planning and beauty all offer innumerable, equally valid approaches. Consequently, we do not expect to like every project we see and are not overly fussed that we found East St Kilda House to be disappointing. Despite not liking the finished project, we can still respect De Campo Architects for their technical abilities, their nurturing of the client relationship and their sharp commitment to environmental and social sustainability. The real value of the Our Houses talk lay elsewhere: in its ability to engage a non-professional audience (Cameron Bruhn, Editorial Director of Architecture Media and MC for the evening estimated that as much as 80% were non-architects) and its exposure of that most secretive thing: the architect / client relationship. We are happy to observe that the former is cropping up in more and more events (Melbourne Open House for instance, discussed here). The latter, however, is both unique and important. It is rare that we are able to hear from client and architect in the same forum, to witness how they interact and understand their reflections post-occupancy. As the publisher of Houses magazine, a journal already standing with a foot in both architectural and non-professional camps, Architecture Media is perfectly placed to explore this format. We hope they continue to do so, seeking unusual architect / client relationships and exposing a side of architectural practice we rarely get the opportunity to share or see. It is perfectly reasonable to refer to The East St Kilda House as a type of Brutalism. Sure it isn’t the Corb variety but as the exterior is a rough hewn brick that is expressed not rendered and there was a will to allow the material to remain in its ‘honest’ state then fine that is a little brutal. Little brutal not grand brutal. Brutalism never had to be just about the ‘raw machismo or structural power’ as you refer to it (think the Smithson house).